Multipurpose Controls Provide Timed Switching Of Electricity In A Variety Of Environments. Multipurpose Controls provide programmable control of power for lights, appliances and more. K Series Multipurpose Controls are self-prompting with Yes/No/Enter programming. Settings are confirmed with an audible signal. Available with 4, 6 or 8 channels. DW Series Multipurpose Controls allow different schedules for each day of the week with up to 99 set points per week. Available with 1 or 2 channels. DTS Series Multipurpose Controls and DZS Series Multipurpose Controls provide 365-day advance, single holiday and seasonal scheduling with astronomic feature. Available with 1, 2 or 4 channels. DZM Series Multipurpose Controls provide direct wire to mechanically held contactors and are used for use with low-voltage latching relays. Multipurpose 1 Or 2 Channel Controls Allow Automatic Timing Of Lights And Other Electrical Applications. Multipurpose controls allow pre-programming of lights in a variety of industrial and commercial environments. E100PB Series Controls are 1-channel digital time switches with an easy-to-read display and supercapacitor backup. 20 set points for same-time daily scheduling. E100B Series Controls are available in 24-hour or 7-day setting types. EWZ Series Controls are capable of different schedules each day of the week. Available with 1 channel or 2 channels. The FMD Series Timers are compact electronic 24 hour/7 day time switch module with heavy duty relay contacts for switching low or line voltage loads. Applicable for time of day control of pumps, fans, heaters, HVAC control circuits, lighting, machinery and many other types of commercial, industrial, and agricultural equipment. The FMD Series features large keys with unique "circular pattern" for easy programming, an easy-to-read LCD display and capacitor backup to retain program memory during power outages. Product features 1/2 HP, 125 VAC; 1 HP, 250 VAC motor. Indoor/Outdoor lighting including fluorescent, incandescent PAR lamps and HID. Ventilating fans in ceilings, bathrooms, windows and whole house types. Lamps, radio, or TV to give the home a "lived-in" look while away. Appliances such as space heaters, coffee makers and entertainment equipment. 6 daily ON and OFF settings, 42 per week. Set once and never set it again. Follows seasonal changes in sunrise and sunset times. One timer switches 120/240/277VAC, 60Hz. Matching protective cover over pushbuttons. 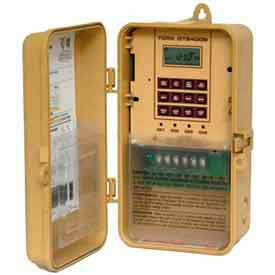 SS Series In-Wall Solid State Timers Provide Digital Time Switching For Lighting Or Motor Loads. 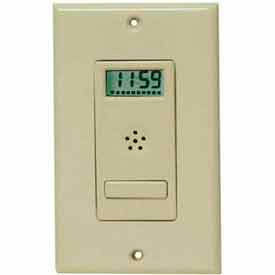 SS Series In-Wall Solid State Timers allow lights or machinery to be switched on manually and switched off automatically. 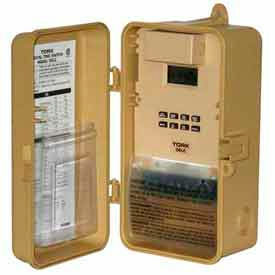 Timers are used for situations where an occupancy sensor is not suitable. Preset time is adjustable from 1 minute up to 18 hours. 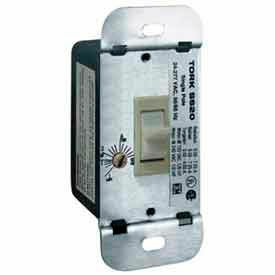 Available with Single Pole Switch or 3-Way Switch. 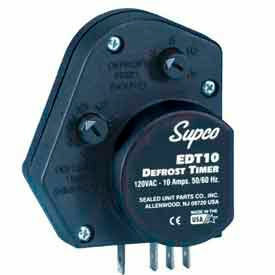 Supco® Electronic Adjustable Defrost Timers Replace Most Units In Domestic & Commercial Refrigerators & Freezers. Offers adjustable defrost frequency from 4 to 12 hours and defrost time from 10 to 35 minutes. Standard size and mount fit most applications. Standard terminal configuration accommodates most connections. Dust proof case. Offers a temperature range of 32 to 135°F. 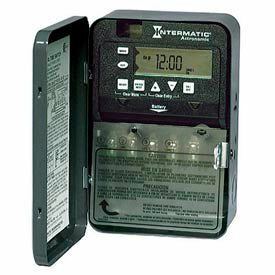 SSA Series Digital Elite Timers Ensure Energy Savings For Lighting Or Motor Loads. SSA Series Digital Elite Timers are made with a Liquid Crystal Display and electroluminescent backlighting for easy reading in light or dark areas. Tamper-resistant time-on interval can be preset. 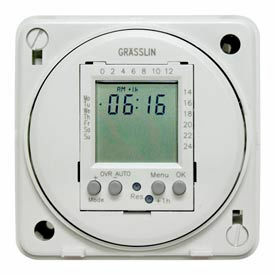 Timers may use manual scroll-up mode, or a fixed interval timer may be used. 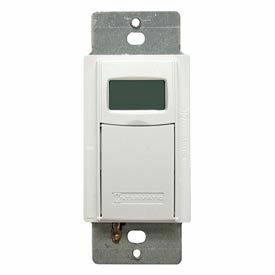 Remote Contactors Are Used For Lighting Loads, Exhaust Fans, Electric Heaters And More. 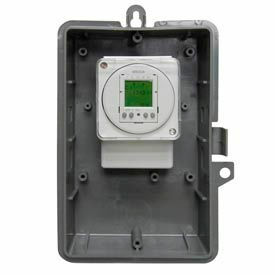 Remote Contactors may be wired either near or remote from controllers. 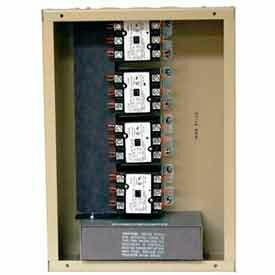 Contactors can switch up to 40 Amps per pole from 120VAC to 480VAC, 1 or 2 circuits simultaneously. Available with 1 or 4 contactors. Digital Lighting Controllers Provide Control Of Lighting And HVAC Systems For After-Hours Usage. 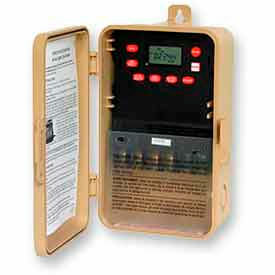 Digital Lighting Controllers are available in several varieties. LC200 Series Controllers feature an interacting electronic control and electronic light sensor. LC200 controllers offer separate control of two lighting zones with settable light level set points. DGLC Series Controllers provide combination light level and time-of-day control for 1 circuit, and photocontrol operation for a second circuit. DLC Series Controllers are multi-voltage dedicated 4-zone lighting controllers. Each zone can be activated by the photosensor, time of day or both. Light level settings and time schedules are assigned independently to each zone. LD Series Controllers are made to meet energy conservation construction codes relative to control of lighting and HVAC for after-hours use.